"Paleo style! Feel free to use whichever type of ground meat you prefer. Use ground pork, chicken, or turkey." Mix together ground pork, kosher salt, black pepper, sage, thyme, rosemary, nutmeg, cayenne pepper, and red pepper flakes in a bowl. Knead with hands until thoroughly incorporated. Form into 8 patties. Place patties into a skillet over medium heat; cook until browned, 8 to 10 minutes. Flip patties and continue to cook until fully cooked through, 5 to 8 more minutes. The best way to wake up! 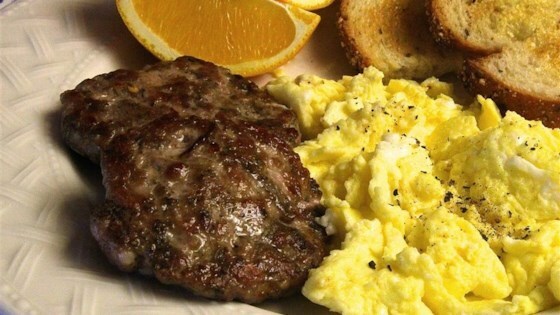 See how to make simple homemade breakfast sausage. Holy Yum! I didn't follow the ingredient measurements exactly, but it turned out great! I like the idea of using maple syrup next time. Absolutely Phenomenal!!! Tastes phenomenal, tastes almost exactly like Jimmy Dean sausage patties or ground sausage, but its better because no added sugars or wheat by products!